Researchers of the JFK assassination are aware of the fact that the three autopsy pathologists, Dr James J. Humes, Dr J. Thornton Boswell, and Dr Pierre Finck, discovered a small 15mm by 6mm bullet entry hole at the base of the President’s skull, 2.5cm to the right and slightly above the EOP (the bump at the middle of the base of the skull). Lone gunman kooks have been arguing that somehow all three of the autopsy doctors were gravely mistaken about the location of the entry wound. The argument by these kooks is that the wound was actually at the top of the skull (in the cowlick region), but somehow all three autopsy doctors mistook the base of the President’s skull for the cowlick! Lone gunman theorists are of course not alone in arguing there was no shot near the EOP, as many conspiracy theorists also reject the doctors’ low entry wound. The primary reason for rejecting it is that the autopsy doctors are not to be trusted, since they lied about the location of the back wound. 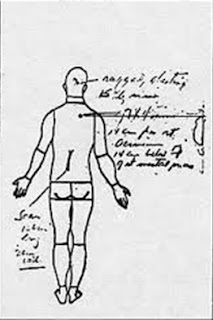 The autopsy photographs have of course proven they lied about the location of the back wound (I can’t for the life of me accept that they were somehow mistaken). Now if the autopsy doctors’ were going to lie about the location of the entry wound to the skull, then why didn’t they claim it was near the top of the skull rather than the base? After all, their placing it near the base would have made it extremely difficult to sell the notion that the bullet entered low then magically deflected upwards in the skull, right? 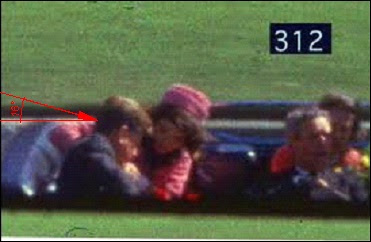 Instead, Humes and Boswell had Harold Rydberg (the Navy medical artist); bend JFK’s head in Ce388 further downwards than shown in Zapruder frame 312. The red arrow shows the approximate location of the bullet in-shoot to the President’s skull near his EOP (with the approximate angle to the 6th floor sniper’s nest being 16 degrees to the horizontal). Frame 312 is undoubtedly problematic for the lone gunman myth, since the bullet upon entering the skull would have to magically deflect upwards. 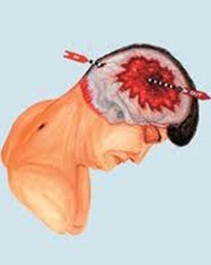 As far as I know, the only two people who advocate for a bullet travelling upwards after entering the skull near the EOP, are John Canal and Larry Sturdivan (I of course am not one to trust Sturdivan after his BS goat experiments for the HSCA “proving” the neuro-muscular reaction). 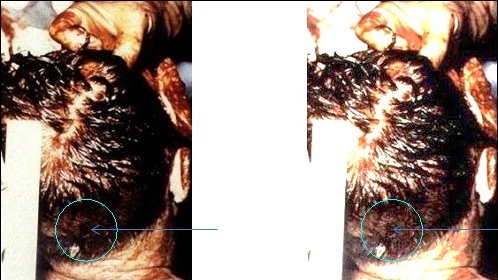 Other “proof” used to denounce the EOP in-shoot, is the absurd notion that the wound cannot be seen in the back of the head autopsy photo. Actually, it can be seen! It’s just a little bit difficult to decipher considering the hair surrounding the wound was partially obscuring it. Below is a copy of the back of the head photo - with a low contrast version. The oval shaped wound described in the autopsy face sheet and report can be seen inside the blue circle in both photos. 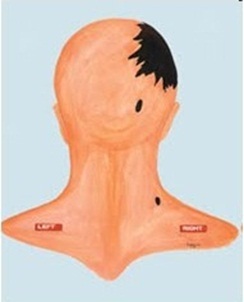 A copy of Ce386, by Rydberg, depicting the wound shows a stark comparison to what is shown in the back of the head photo. The location shown in Ce386 is undoubtedly not accurate, but let’s remember that Humes and Boswell went to Rydberg with no notes or photos. It’s Just one good example of a cover-up. Still, diehard Warren commission zealots will argue that what we are seeing in the autopsy photo is nothing but an anomaly. Really? So there just happens to be an anomaly which bears a strong resemblance to what is depicted in Ce386, and it just happens to be low and near the middle of the skull? That’s one hell of a “coincidence” don’t you think? If this is not the real entry wound, then what is it? Well, probably nothing more than a spot of dried blood. Just look around the scalp. 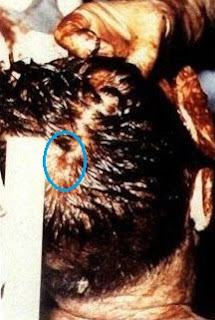 There are numerous areas of dried blood, one area just below, and many in front of the alleged Cowlick entry wound. Are they entry wounds too? Well, of course not. It’s only in the imagination of lone gunman zealots. Clearly, the Conspiracy theorists they despise are not the only ones who are delusional. Not surprisingly, when the HSCA came into being, the medical panel headed by Dr Michael Baden also came to the conclusion that the entry wound was actually in the Cowlick. During his deposition before the panel, Dr Humes did concede to the panel’s conclusion that he was mistaken about the entry wound. However, he did so only after being put under great pressure by the panel. Boswell and Finck on the other hand, never wavered from their belief the wound was near the EOP. During his ARRB testimony, Humes reverted back to the EOP in-shoot. For more on the EOP in-shoot, and information on the other witnesses who saw a wound near the base of the skull, be sure to check out Pat Speer’s brilliant work on his website. Let me finish off by saying that nothing demonstrates the arrogance and hypocrisy of lone gunman kooks more than their belief the Doctor’s somehow mislocated the entry wound. They constantly tell conspiracy theorists, that we are desperately trying to find any evidence of conspiracy. Yet, by insisting the autopsy doctors’ were mistaken about the location of the in-shoot (which simply defies common-sense), they are the ones who are desperate. Furthermore, when you take into account Pat Speer’s analysis of the ear witness statements demonstrating the shot to Connally at circa Zapruder frame 224 was from a rifle using a silencer/suppressor, and combine that with the near impossibility of a bullet deflecting upwards in the skull, you have proven a conspiracy behind the assassination.